Monitor and respond to customer satisfaction while decreasing customer concerns. Develop the skills of all employees and encourage employees to participate in system improvement. Meet all defined customer requirements in a cost-effective manner reflecting continual performance improvement. Develop, manufacture and market products that are safe for their intended use and efficient in their use of energy. Reduce or eliminate pollution and waste. 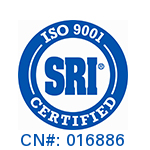 Duke is an ISO 9001:2008 certified manufacturer. In addition, incorporated into our quality management system is an approved UL Data Acceptance Program for our new product development laboratory with mandated compliance clauses to ISO: 17025. Duke supports our green environment and is an ISO 14001 certified manufacturer.